One of the last things that Jesus told his disciples before he ascended into heaven is that they were to go to the upper room in the city of Jerusalem and wait for the promised Holy Spirit. I do not know if, after ten days of waiting for the Spirit to arrive, the people in the upper room perhaps had begun to settle into a routine. It is difficult to consistently remain in a state of high expectation. We know this ourselves. As believers in Christ, we are also awaiting a promise. When Jesus was on earth, he spoke often of the fact that he would be leaving, but then someday return to rule in his kingdom. I think that in the first months after Jesus ascended into heaven, his followers probably woke up every morning wondering if this could be the day that Jesus would return. Then the months turned into years, the years into decades, and the decades into centuries. We sit now two thousand years afterwards, and we still await the return of Jesus. Those of us who believe in Jesus also believe the fact that his return may be any day. Even today. However, if you are like me, this is rarely, if ever, your first thought when you wake up in the morning. We are more likely to think about what we are to do on that day, or else about making some coffee. Although we know that Christ may return today, we have settled into a routine. We should be careful about doing this. Although we may not be able to keep ourselves in a constant state of elevated attentiveness, we must always be attentive. 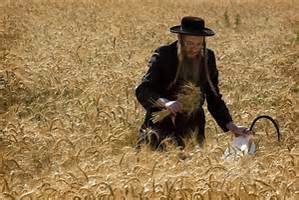 In the Old Testament the Jews had a festival called “The Feast of Weeks," or Shavuot. It was an annual holiday that took place at the beginning of wheat harvest. The festival not only had the purpose of giving thanks for the harvest, but in Jewish tradition, it was also on this day in history that Moses was given the Law of God on Mount Sinai. I give you this little background about this day, because it is this day that in the New Testament is called “Pentecost.” It is also the day we still observe today, fifty days after we celebrated Easter. The word Pentecost actually does mean “fiftieth day.” It also comes ten days after Ascension Day. Ascension Day was the day when Jesus ascended into heaven, as witnessed by his watching and wondering disciples. On the isle of Patmos, John had seen and heard many things pertaining to the end of the first things – the first heaven and the first earth. He saw also the ushering in of the new things, the new heaven and new earth. In this last of his visions given in the book, the first heaven and earth had already passed away. He now witnesses the holy city, the New Jerusalem, descending from heaven. John described all these things to us. But as I mentioned before, John was working with some substantial disadvantages. First of all, he saw creatures that defied description and witnessed events that surpassed any human understanding. He was shown buildings and formations unlike any that that he had ever before seen. Several times in the book, John had to be given an explanation for what he was witnessing, since he had no understanding about it whatsoever. These were only the first of his problems. Added to these difficulties is the fact that he was, of course, limited in his explanation of what he saw to human words in describing them, words that he could actually understand and that we can understand. Even in our own experience, we know that this is often an impossible task. As I write, I am sitting on the back porch of our home, which faces toward the western horizon. The sun is just setting. I could describe it to you to give you an idea what the sunset looks like on this evening. I could tell you of the colors, of some darker clouds that have blanketed part of the horizon, and of the few defiant rays from the sun that refuse to allow themselves to be restrained by the clouds and are streaming across the heavens, angling down to where I sit on my porch. If I am good enough with my words, I might be able to put some sort of picture into your imagination that approaches that which I see, but even if I go into very great detail, what you picture in your mind, formed from my explanation, can never approach what I am actually seeing. Perhaps you have seen enough sunsets yourself that you have also seen similar ones, so as I explain, you can get an idea. But the picture in your mind can never be exactly the same as what I am seeing at this moment. Now, if you would add to that the fact that John was trying to explain something that he had never before seen, and we, reading his explanation, also have never seen any similar thing, well…you can see the difficulty. John, given his severe disadvantages, is explaining what he is seeing the best that he can. As we read his description, we naturally relate his words to the things that we have seen in our own experience. In our minds, we began to form a mental image of his explanation. We also do the best that we can. Quite honestly however, I am sure that any depictions that we have formed in our minds, in no way approach the reality of what we will one day see. In John’s vision, he saw ahead to the time when the first things had passed away. When Jesus talks about the first things, he is talking about what are what we experience now. We are living during the time of the first things. It in this period and in this place where we must go through times of mourning. We are in the place of crying and of pain. But in the New Heavens and the New Earth, these things will no longer exist. “He who sits on the throne said, ‘Behold, I am making all things new…Write, for these words are faithful and true…It is done. I am the Alpha and the Omega, the beginning and the end.’” (Revelation 21:5-6a NAS). “It is done.” This is a statement of completion, of something that has reached a conclusion. Do you remember the very last thing that Jesus said, as he hung dying on the cross? Just before his head sunk to his chest and he gave up his spirit, Jesus uttered these words: “It is finished” (John 19:30).